The Oklahoma House of Representatives has passed a bill that would reduce waiting periods and expand opportunities for expungment of Oklahoma criminal records. The bill, which sailed through the House with unanimous bipartisan approval, now faces review in the Oklahoma Senate. If signed into law, the Oklahoma expungement reform would be the second major revision of Oklahoma expungment laws in two years. 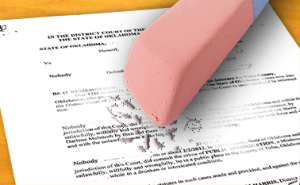 A 2014 Oklahoma expungement reform recognized that even repeat offenders can clean up their act. The reform allowed expungement of multiple misdemeanors, when 10 years have passed since the most recent misdemeanor conviction. The 2016 measure would cut that waiting period to five years. While the 2014 law also cut in half the previous two year wait for misdeanor expungement after completion of a deferred sentence agreement, the proposed reform allows those expungements to go forward even after prior misdemeanor convictions. Prior misdemeanors would also be removed as barriers to expungement of non-violent felonies. Oklahoma House Bill 2397 would allow court records to be sealed immediately after some misdemeanor offenses. Those misdemeanors where the only penalty was a fine under $501 would be qualified for expungement upon payment of the fine. One apparent flaw in the popular 2016 expungement reform could prove to be a barrier to expungement of some currently expungeable misdemeanor convictions if not cleaned up before the bill becomes law. Rep. Travis Dunlap, who sponsored the bill, told Wirth Law Office the Senate might fix that language before engrossing a version to be resolved with the house version in a conference committee. To set newly allowed under-$501 expungements apart from other misdemeanor expungments, the bill includes a new clause that defines other expungeable misdemeanors. That clause allows expungment after five years in misdemeanors that resulted in imprisonment or suspended sentences. As result of that new clause, the House language excludes reference to misdemeanors where the only penalty is a fine of $501 or more. Although courts more often impose or suspend jail terms in those offenses, numerous Oklahoma misdemeanor laws provide for fines of $1,000 or more in addition to, or in lieu of imprisonment. It is not the first time Wirth Law Office noticed ambiguous language in an Oklahoma expungment law. The 2014 reform clarified that multiple misdemeanor or non-violent felony charges arising from a single incident count as one offense for the sake of expungment proceedings. Wirth Law Office had argued as much in the Oklahoma Court of Criminal Appeals. As sometimes happens in lawmaking, narrow gaps in meaning that might be reasonably traversed with common sense can be pried into uncrossable voids when eager prosecutors zealously enforce every last letter of a statute, as they read it. Over our astute arguments to the contrary, the appeals court had sided with prosecutors who urged a narrow reading of the law. We told the court that was not what legislators intended. Legislators had the last word. Lawmakers codified our interpretation as law after seeing the published case we brought to the appeals court. Legislators have favored expungement reforms as a way to get people back to work after putting legal problems behind them. Oklahoma expungment law says employers may not require job applicants to disclose expunged offenses, including old felony convictions. Nor may employers refuse to hire applicants who decline to disclose expunged offenses. In fact, those with records expunged in Oklahoma do not have to tell employers they were ever convicted of a felony. The law says – twice – that they can legally say no court action ever occurred. [S]ubject official actions shall be deemed never to have occurred…and the person in interest and all criminal justice agencies may properly reply, upon any inquiry in the matter, that no such action ever occurred and that no such record exists with respect to such person. Although Oklahoma’s otherwise tough-on-crime legislature is building a track record of merciful expungement reforms, permanent sealing of criminal records is not a foregone conclusion in any expungement petition. Oklahoma expungement law allows law enforcement agencies or district attorneys – or the prosecuting agency under the proposed law – to petition for unsealing expunged records. Arresting agencies, prosecuting agencies or anyone else the court finds relevant to an expungement proceeding must also be notified of a hearing before an expungement is ordered. To grant an expungement, a court must find that harm to privacy of the person outweighs interest in keeping criminal records opened. In no case does expungement ever accelerate physical destruction of criminal records. Expungement of criminal records provides the obvious benefit of keeping past mistakes out of view of future employers. It allows people who have turned around after minor mistakes to develop a professional career rather than stumbling backwards toward a criminal career. With a clean criminal record, a person can often rebuild credit ratings, qualify for real estate or business loans and establish a foundation of wealth. Professional licenses unattainable to those with criminal records may be within reach after expungement. Expunging a criminal record keeps a few months of probation from becoming a life sentence. It allows a person to restore peace of mind and to regain confidence from the community at large when clouds of doubt are cleared along with criminal records. It provides a clean record a person can proudly keep clean. For the community, expungement increases the tax base and reduces dependence on public assistance. A 2014 study at Stanford University prepared for the San Jose State University Record Clearance Project found expungement could increase individual incomes by as much as $6,190 a year. Misdemeanor conviction with fine of under $501 and no term of imprisonment or suspended sentence: expungement filings can be submitted immediately after payment of fine or satisfaction of fine by time served if person has not been convicted of a felony and no felony or misdemeanor charges are pending. Misdemeanor conviction with jail sentence or suspended sentence: would reduce from 10 to five years the waiting period for expungement. (As with current law, only if no misdemeanor or felony charges pending and at least one year after charge dismissed, and no prior felony convictions. Not more than two non-violent felonies: newly allows expungement after 20 years have passed since the most recent felony or misdemeanor conviction. The law would newly allow expungment after a second non-violent felony, but like the current law, only allow expungment if a full pardon has been granted, and if no felony or misdemeanor charges are pending. A single qualifying non-violent felony can currently be expunged after 10 years with no other misdemeanor convictions in the past 15 years. The law would also expand the definition expungement to include sealing of public civil records in addition to criminal records. If you have been convicted of a misdemeanor or non-violent felony in Oklahoma, contact a Tulsa expungment attorney to find out when you will be eligible to petition for expungement. While there are some costs involved, research shows the benefits far outweigh the costs. Oklahoma law even provides for a refund of filing fees when courts approve an expungement petition. For a free consultation with an Oklahoma expungment attorney in Tulsa, contact Wirth Law Office at (918) 979-1681 or use the form at the top of this page to schedule your free expungement consultation.